Lately I have been really obsessed with goat cheese. Or to be more specific, goat cheese + fruit. Most often I just add both to a salad, but there have been a few stand-out dishes that were a bit more involved. I came across this recipe in Southern Living a few months ago, and I've been waiting for a chance to make it ever since. During strawberry season, we always have at least one big container of strawberries in the fridge, yet somehow I just kept forgetting about this. But one day when pickings were slim for lunch, I was going to just make a snack plate of some fruit and cheese, when I suddenly remembered this recipe. Luckily, I had pretty much everything on hand, so I excitedly threw this together. And I absolutely LOVED it. Given my love for all things fruit and goat cheese, that should come as no shock though. And while I loved the cheese and the strawberries together, what made this sandwich killer was the pepper jelly. Just a hint of spice mixed with the sweet strawberries and tangy goat cheese just put it over the top. This made an awesome lunch, and one I plan to enjoy as often as possible during strawberry season. Spread one side of each slice of bread lightly with butter. Flip the bread over, spread half the slices with pepper jelly, and top with half the goat cheese. 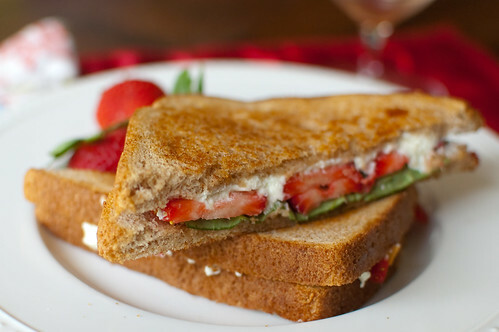 Lay the strawberry slices in a single layer, sprinke with basil, salt, and pepper, then spread goat cheese on the remaining slices of bread. Top the strawberry side with the reamining bread. Cook sandwiches 2-3 minutes per side, or until golden-brown. Serve. Its like the bruschetta only grilled. I love fancy grilled cheese sandwiches, so I'll have to try this! My knees always go wobbly for things with goat cheese. This sounds amazing...can't wait to try it. Red pepper jelly - sounds very intriguing - gotta find it! This grilled cheese looks super yummy, Josie. Great flavors! I would have never thought to combine goat cheese and strawberries, but it sounds so delicious! Thanks for sharing. One of my favorite appetizers is goat cheese and strawberry crostini - but this is a much better way to eat it for lunch! I recently made a salad with strawberries and goat cheese and a balsamic reduction and now I'm in LOVE with the combo! Definitely need to try this! I adore the goat cheese + strawberry combination! I put it on a pizza with some arugula last year. It's the perfect spring combo. Thank you for the collection of goat cheese recipes! This is exaclty what i need. Why does goat cheese go well with everything? Sam's Club has an amazingly delicious (and affordable!) log of goat cheese covered in blueberries. It's SOOOO good! I bought one for a party, but still have half a log left. I keep thinking I'll make something out of it, but just continue to eat it. Shawnda, that is one of my favorite apps too - I could eat it every day! Kira, that pizza sounds amazing. I'll have to look it up in your blog! Erin, Trader Joe's has a blueberry goat cheese too. LOVE it! I used it in my blueberry goat cheese focaccia and it was fantastic! oh my gosh YUM! This looks phenomenal!